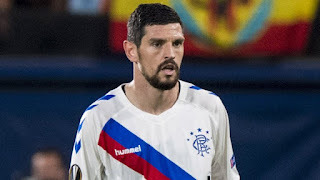 As we wait upon the fourth return of Graham Dorrans to our first team, we have to seriously ask what on earth Ibrox chiefs were thinking in the first place by signing him. Now, you may ask why we’re posing this; he was, after all, a Scottish international, an EPL ‘regular’ and a boyhood Rangers fan. However, not only did alarm bells ring when Norwich fans weren’t bothered about losing a ‘luxury’ player (when a team’s fans show apathy about a player leaving it’s never a good sign) but if Rangers had done due diligence on Dorrans’ playing and injury history over the past five plus years before he actually joined, they’d have learned he was in and out of the first team frequently, with a massive number of injuries. Aside 11/12 and 14/15 (a mixture of EPL and championship) Dorrans never managed over 28 (frequently well below) appearances in any season since 2010. And yet our bosses decided to shell £1.5M out on him following yet another injury disrupted season with a medial knee ligament (sound familiar?) injury. As we mentioned earlier, we signed a clearly unfit player in Eros Grezda, which suggests our medical team either isn’t diligent enough or we simply haven’t learned from Dorrans. We reiterate earlier opinions – Dorrans when fit is an electric player and can open a tonne of defences. His cameo in Spain earlier this season gave a glimpse of his quality. But to barely manage two full seasons in the past eight total gives some idea of how he just isn’t a player Rangers can rely on for a lot of matches. And deeply questions why we signed him in the first place. That management team brought in Herrera , Pena , Dalcio , Cardoso , Alves and you think the big mistake was Dorrans ? The simple reason was that we were so desperate to get in some quality that we gambled that the guy was over his injuries .To be fair he was, until he was done by an over the ball tackle from Power of Kilmarnock .Granted he has struggled since then but that tackle would have put anyone out of the game. Good points man, well said! Regardless of whether or not we should've signed him the fact is we did. It's not his fault he got injured. So let's get him fit and see if we can get some value from him in a Rangers shirt.